Healthcare professionals from across Scotland, UK gathered at a specialist event exploring the Scottish Waiting Times Improvement Plan. The event looked closely at flexible infrastructure strategies to help NHS Boards across the country meet requirements to reduce the length of time people are waiting for diagnostic and surgical procedures. Healthcare professionals from across Scotland gathered at a specialist event exploring the Scottish Waiting Times Improvement Plan. Held at Glasgow’s Golden Jubilee Hospital and hosted by medical technology organisation Vanguard Healthcare Solutions, the event looked closely at flexible infrastructure strategies to help NHS Boards across the country meet requirements to reduce the length of time people are waiting for diagnostic and surgical procedures. The event brought together senior estates, management and clinical professionals from across Scotland and was held the day after the announcement of additional funding by the Scottish Government in a bid to shorten waiting times for people receiving medical procedures. Health boards have been allocated around £27 million in initial investment as part of a £850 million strategy to tackle the issue. The Waiting Times Improvement Plan was announced in October last year and aims to “substantially and sustainably” improve waiting times for outpatient and inpatient appointments, as well as day cases, by Spring 2021. 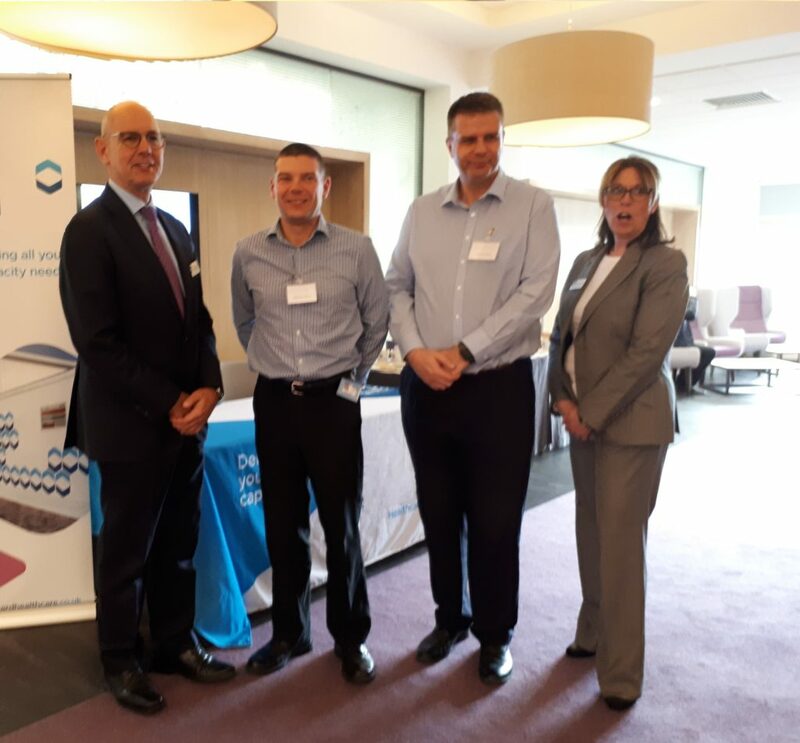 The event was opened by Lindsay Dransfield, Commercial Director at Q-bital who told the assembled delegates of the long history of Q-bital working with Health Boards in Scotland to help them build solutions and enhance their capacity which spans almost 20 years. She said: “The Scottish Government recognises the increasing demand on the whole system of health and care and has issued an improvement plan which focuses on the length of time people are waiting for these procedures. Delegates also heard from Alan Ward and Kenny Oliver from Raigmore Hospital in Inverness which has been using a Q-bital unit to boost capacity in orthopaedic and breast procedures, as well as a temporary emergency theatre, for several years. They explained their experiences of using a Q-bital unit in these ways had been extremely positive and had helped them to work at a higher capacity. The delegates also had an opportunity to tour a unit on site at Golden Jubilee which is used exclusively for cataract procedures and which has been in place for two years. The unit is an example of how a mobile solution is being utilised in a real situation by clinical staff on a daily basis. Lindsay added: “The event was a great way to bring together professionals from Health Boards and the Scottish Government as well as others working in the sector to look at what can be achieved through the use of innovative and creative solutions, such as mobile and temporary units. Q-bital mobile clinical units can increase clinical capacity in both planned and emergency situations and can help with reducing procedure waiting times. Alongside its temporary mobile clinical environments such as operating theatres, endoscopy suites, day surgery, clinics and ward space which help healthcare providers, including the NHS, increase patient capacity and clinical space, Q-bital also provide highly trained support staff.